President Donald Trump was intentionally harming children to further his policy goals. This is no secret. He and his administration stated their intentions. Little ones pine for their mom and dad as border agents mock the sound of their cries. 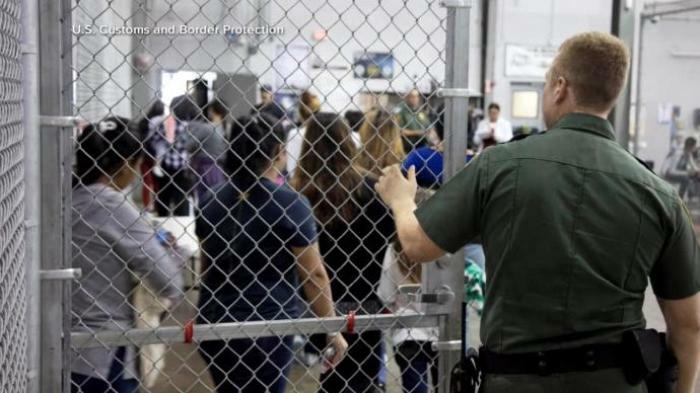 Babies and toddlers sent to "tender age" shelters. Kids and parents unable to speak to each other, never knowing when or if they'll see each other again. Ten-year-old with Down syndrome separated from her mom. Plead guilty or you may never see your son again, judge says. The American Academy of Pediatrics, American College of Physicians, and the American Psychological Association all warned that these children will suffer long-term psychological harm due to being separated from their caregivers. Our government committed child abuse. Cruelty to children wasn't an accidental feature of Trump's policy, it was the intended method of Trump's policy. "ENOUGH of the misinformation. This Administration did not create a policy of separating families at the border," the White House tweeted Monday. On March 6, 2017, CNN's Wolf Blitzer asked Department of Homeland Security Secretary John Kelly if he was considering a policy of separating undocumented immigrant children from their parents. "I would do almost anything to deter the people of Central America, to getting on this very, very dangerous network that brings them up through Mexico into the United States," he answered. When asked for clarification, he added, "Yes, I am considering (that), in order to deter more movement along this terribly dangerous network. I am considering exactly that. They will be well cared for as we deal with their parents." Later that month, Kelly denied that he was considering a policy of separating children from their families, telling CNN, "I don't think I have said that. ... We might under certain circumstances do that, but I don't think I've ever said as a deterrent or something like that." On April 6, 2018, Attorney General Jeff Sessions announced a new "zero tolerance" border policy in a memorandum to federal prosecutors. Sessions described the new policy in a May 7 Scottsdale, Arizona speech, explaining, "If you are smuggling a child, then we will prosecute you and that child will be separated from you as required by law. If you don't like that, then don't smuggle children over our border." Shortly after, U.S. Border Patrol and Customs began implementing Sessions' warning. In a May 11 NPR interview, Kelly, now White House chief of staff, said he agreed with the policy of separating children: "But the laws are the laws. But a big name of the game is deterrence. ... It could be a tough deterrent — would be a tough deterrent. A much faster turnaround on asylum seekers." Last week, White House Senior Policy Adviser Stephen Miller spoke with The New York Times for an interview that was approved by the White House. Miller told NYT that he convinced Trump last month to implement the policy of taking undocumented immigrant children from their families. In response to an increase in border crossings, Miller added, "It was a simple decision by the administration to have a zero tolerance policy for illegal entry, period. The message is that no one is exempt from immigration law." Trump's intent was clear: hurt children to deter illegal immigration. Due to an accidental combination of what is known as the Flores settlement and some other changes, the law does make it difficult to keep families together when combined with Trump's strict border enforcement policy. Both of Trump's predecessors, Presidents Barack Obama and George W. Bush, had to deal with the same problem, but family separation was only used as a last resort and neither chose family separation as a deterance motive. Conservatives this week have been arguing that Obama had the same immigration policies as Trump, which is odd given that Trump ran on a platform arguing that Obama was soft on immmigration. Obama's immigration policies were certainly awful, and many on both the Left and the Right said so at the time, but Obama didn't go as far as Trump. Plus, even if the "Obama did it to" arguments were true, it wouldn't make them right. After much public outcry, Trump ended the policy on Wednesday, but he never had to start it. While all three presidents have had to choose among several bad options, only Trump chose the worst option. Trump's lack of empathy for those who suffered under his policy continued after he abandoned the policy. Thursday, he compared the journey through Mexico to a walk through Central Park. Friday, he claimed the news of trauma caused by family separation were "phony stories of sadness and grief." Plus, his administration is still using the kids to get what it wants rather than quickly reuniting them with family. Sunday, The Texas Tribune reported that asylum seekers were told they had to agree to deportation in order to be reunited with their children. Trump's harm-children-policy had a second purpose as well — to force the Democrats to negotiate on a compromise immigration bill. On June 15, he tweeted, "The Democrats are forcing the breakup of families at the Border with their horrible and cruel legislative agenda. Any Immigration Bill MUST HAVE full funding for the Wall, end Catch & Release, Visa Lottery and Chain, and go to Merit Based Immigration. Go for it! WIN!" And on June 18, he tweeted, "It is the Democrats fault for being weak and ineffective with Boarder [sic] Security and Crime. Tell them to start thinking about the people devastated by Crime coming from illegal immigration. Change the laws!" It's not clear if this was originally part of his plan to hurt kids to get what he wants, but it certainly became part of his strategy. Trump wielded inhumanity as a political weapon. For the sake of the kids, let's pray he doesn't try it again.